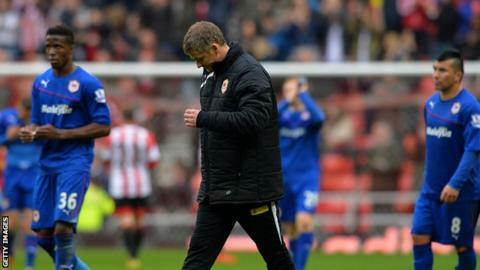 Cardiff City boss Ole Gunnar Solskjaer says his side will not give up on hopes of staying in the Premier League despite losing 4-0 to relegation rivals Sunderland on Sunday. The result leaves the Bluebirds bottom of the table, two points from possible safety with just two games left. Solskjaer says his side need six points from those fixtures against Newcastle and Chelsea to stay up. "Two wins that's the way back. That's the only way back," said Solskjaer. "I've got to look forward to the next game. I'm built that way anyway that I can just look to the next one and win that one. "You don't give up until it's over." Cardiff might have had an early penalty before Connor Wickham's header gave Sunderland the lead at the Stadium of Light. Black Cats defender Wes Brown fell into Fraizer Campbell to stop the City striker getting a shot away, although the forward got up and chased down the loose ball as the chance went begging. Sunderland's second came in controversial circumstances. Wickham pounced on an error by Juan Cala - and had his arm pulled by the centre-back in an offence which seemed to stretch to just inside the area. Referee Phil Dowd initially played the advantage but, when Wickham failed to capitalise, awarded the home side a penalty and showed a red card to Cala. Solskjaer refused to comment on the controversial decisions. "It's one of them, you accept it and you just move on," said Solskjaer, "because there's absolutely nothing you can do. "You can run onto the pitch and try to make him [the referee] change his mind, but he won't." Solskjaer paid tribute to the Cardiff fans who made the long journey to the North East and promised City will keep fighting. "The fans were fantastic again. We really appreciate their support and we promise we'll give it a go against Newcastle."